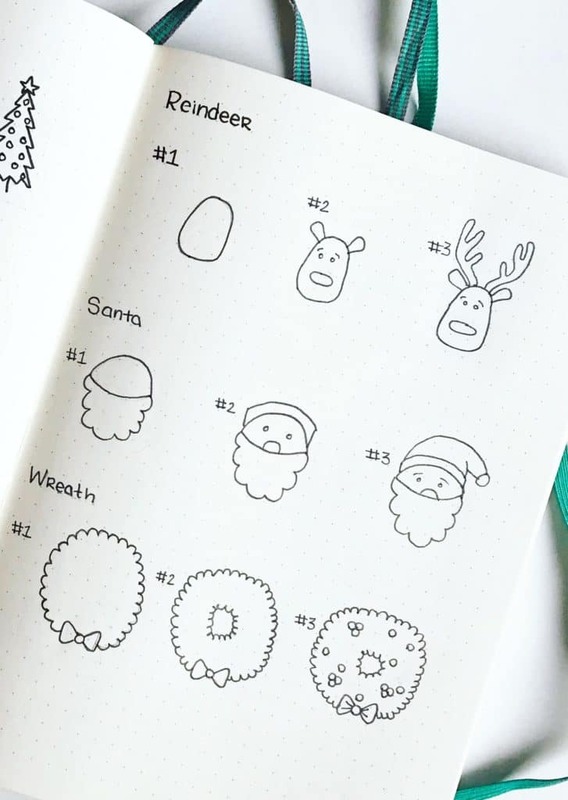 Learn to draw festive Christmas doodles with this step-by-step guide and free drawing cheatsheet. If you didn’t notice by now, I love doodling. And for a good reason. Doodling can help reduces stress and open your mind up to new ideas and thinking. Did you ever get told to stop doodling during a lecture in a school? I don’t know how many papers I turned in that had flowers and hearts doodles along the edges. It ultimately ended with me having to have a little chat with the teacher about using my time wisely. Well, now I’m an adult, and I say “doodle to your heart’s content”. Doodling has been more than a creative exercise for me. It’s been my go-to when I’m bored, sad, or just wanting to put pen to paper. Tooting my own horn here; I’ve become a pretty good doodler. But, I know that not everyone feels as confident with their doodling skills. There isn’t a step-by-step guide to improving your doodling or drawing skills. You won’t become Walt Disney overnight. It takes time and most of all consistent practice. Spend a little time doodling every day. It doesn’t matter if they look like stick figures or first-grade flowers. We all have a starting point and have to work from there. Never compare your beginning to someone else’s middle. One doodling exercise that has stuck with me is filling a page full of doodles. Sit down with a blank piece of paper and any old pen, and start filling the page with random doodles. Don’t try to make them neat or have them relate. You just need to fill the page. This exercise came from a Skillshare course I took called Exploring Your Creative Style: Draw an Expressive Alphabet. Timothy Goodman explains that this exercise is similar to how athlete’s warm-up. As creatives, we have to warm-up too. And this exercise has helped me develop new skills and come up with ideas that I otherwise wouldn’t have. I highly suggest taking a few courses on Skillshare if you are serious about improving your creative skills. They have a huge selection of courses to take, and more are added every day. Gaining confidence in your creative skills is going to come as an additional benefit to practice. The more you practice, the more you will see your abilities evolving. 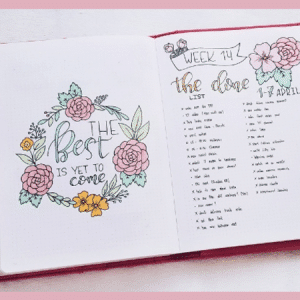 You will see improvements and feel more confident when you sit down to doodle. So, take your time, be content with your beginning, and work from there. Now for the fun stuff. 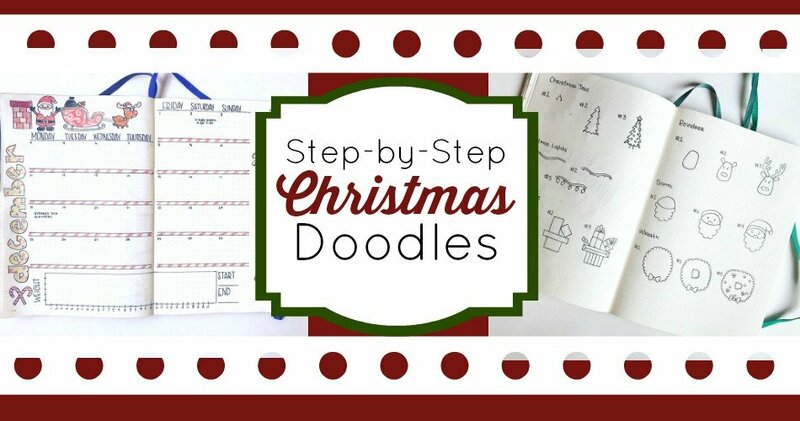 I’m going to show you how to recreate some step by step Christmas doodles. And at the end, you are welcome to download a PDF cheatsheet on drawing three different doodles. 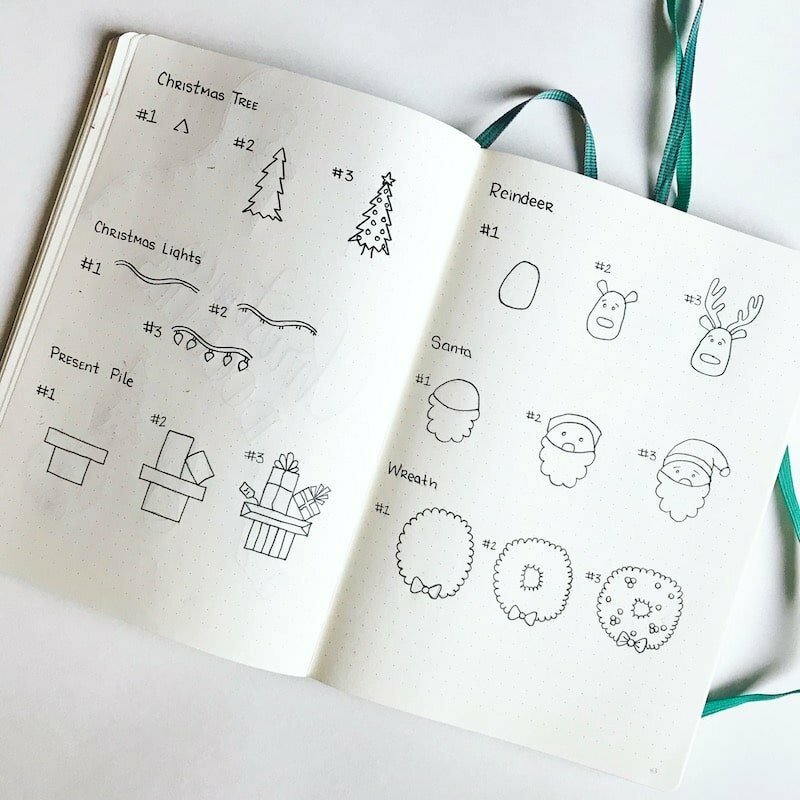 You’ll learn to draw a Christmas tree, Christmas lights, a pile of presents, a reindeer, Santa, and a wreath. Christmas Tree: Start by drawing a small triangle without the bottom corners connected. Then repeat that shape but slightly bigger, connecting it to the open portion of the small triangle. Continue doing this until you have a tree shape that you like. Then make a zig-zag line along the bottom to connect the final triangle. Add a stump, a star on top, and balls. Christmas Lights: Draw a wavy line and then repeat the same line just below it to make the strand. Then, draw two little lines close together, perpendicular to the light strand. These will be where you draw your lights so space them accordingly. Finally, draw upside down teardrop shapes connected to the small lines you drew previously. 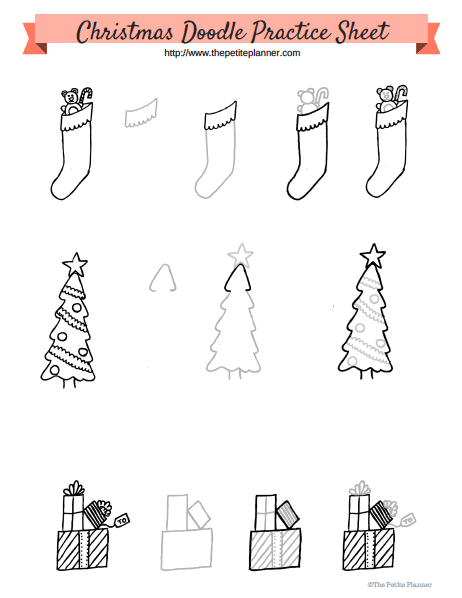 Stack of Presents: Start by drawing a large rectangle. Next, draw a long skinny rectangle on top. Then add a vertical rectangle and an angled rectangle on top of the skinny horizontal rectangle you just drew. 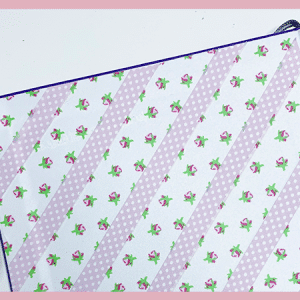 Add designs to the boxes as you like (stripes, polka-dots, a cross for ribbon). Finally, draw bows on the top boxes and add any gift tags you like. Reindeer: Start by drawing an oblong oval. Then add circles for eyes, an oval for a nose, two arched lines for eyebrows, and two ears. In the last step, draw the antlers. 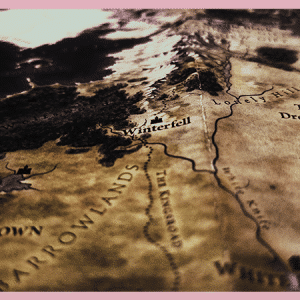 The outer line should have a slight curve and the inside’s should have a few areas that branch out. Make the two antlers similar. Santa: First, draw a half circle and then draw a curved line to connect both ends. For the beard, make a bubbly shape. Think of drawing a cloud. In the next step, add the band for his hat, two circles for eyes, and a half oval for the nose. Finally, add eyebrows and draw the hat. Wreath: Start by drawing a large circle in pencil. Then draw a smaller circle in the middle in pencil. Create a bubbly texture around the outside of the large circle in pen, leaving a gap at the bottom for the bow. To draw the bow, start wit ha small circle in the middle and then draw two connecting soft edge triangles. In the second step, create the same bubble-like texture around the inner circle. Make sure your bubble shapes are facing towards the inside. In the last step add lines to your bow and draw some small circles within the wreath. 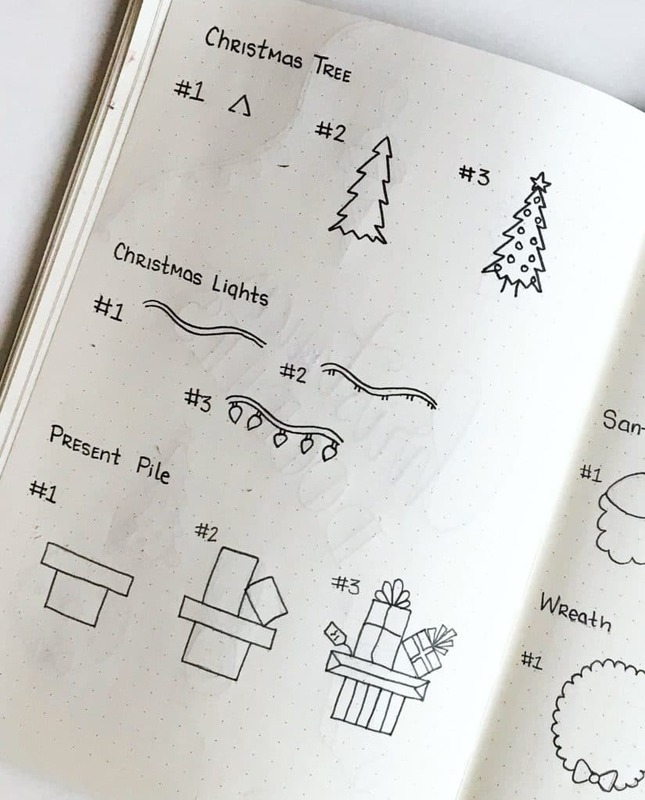 This cheatsheet shows you the exact steps to draw a stocking full of goodies, a Christmas tree with garland, ornaments, and a star, and lastly, a stack of presents. The gray areas are what you will draw in each step. The black lines are pieces you have already drawn. 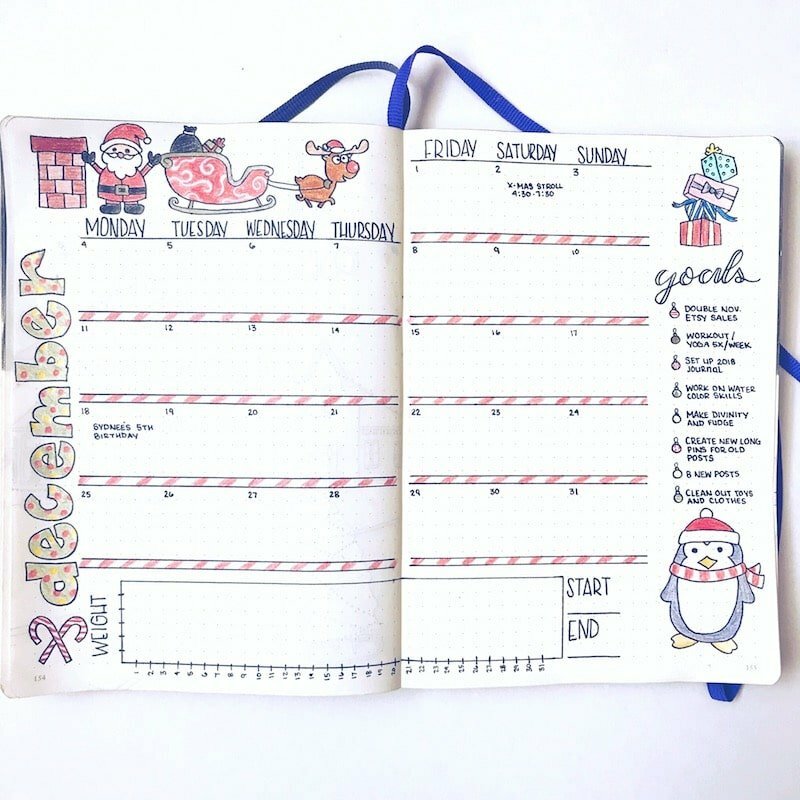 Be sure to tag me in your Christmas Doodles on Instagram, @the.petite.planner. I can’t wait to see what you come up with. 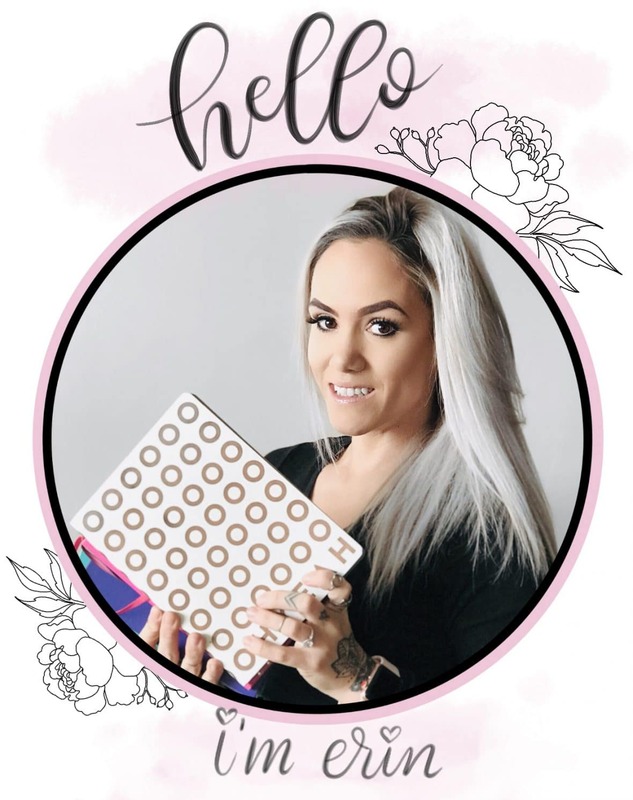 Want access to all my free printables and creative tips sent directly to your inbox? Subscribe to my newsletter and you’ll be able to access the VIP Resource Library right away.